Here's a great box/bag holder perfect for your Christmas gift giving. You can find the directions here. I changed the punch on mine - I used the large oval punch for my handle, and the Tag Corner Punch instead of the corner rounder. You'll need 4 pieces of DSP cut 1 of each size 3"x 3", 2 1/2" x 2 1/2", 2" x 2" and 1 1/2" x 1 1/2"
I used the Star Punch for the star and the 3/4" square for my tree trunk. I used the Double Vanilla Technique from the TJNL along with my Snow Burst set for the background, and added some glitter bling to my snowflakes. To balance out the bling - I added some to the handle and on my sentiment to resemble brads. Don't forget the Designer Series Paper is on special this month - Buy 3 get 1 FREE! The Snow Burst set can only be ordered through November 30, email me today to place your order! Here's a close up of the tree. 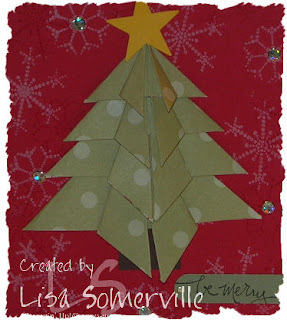 Here's another card I made using the folded tree directions. Oh so pretty Lisa!! Thanks for playing along. LOVE your oragami tree. What a great touch for that added dimension. Your boxed bag is a gift within itself. What a creative & fun bag Lisa!! I am such a BAG lady!!! Ask anyone who knows me here in El Segundo. 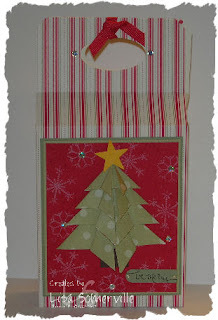 Your decorated bag is beautiful, I love the 3D look of the tree. I've gotta get Charlotte over here to help me do that oragami tree! Thanks for the directions. This is really awesome!! I saw Lauren's bag yesterday, and I love the oragami tree on your bag! Wow! !